Traditionally as part of a cremation service, ashes are placed in an urn and then given to loved ones so that they may do as they wish with them. Not only is it a beautiful way to send somebody off from the physical world, but it’s also personal. Today, cremation urns for ashes come in all sorts of shapes, colours, materials and sizes. 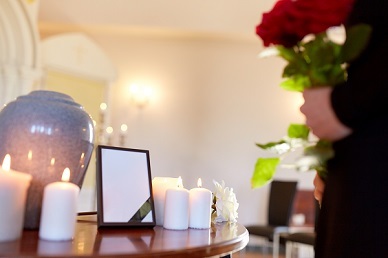 When selecting one of the many funeral urns available for either yourself or a loved one, there are a few questions to ask if you want to choose the one that is just right for the occasion, as your selection will ultimately depend on more factors than just a cremation urns cost. 1. What is the Intended Final Resting Place for the Urn? When relatives are given an urn with the remains of a loved on in it, they tend to have a few usual options in deciding what comes next. – Land or water burial: If you decide to bury the ashes in an urn, you may want to again select a biodegradable urn, as it will eventually and organically become part of the earth again over time. Ashes can also be placed in any urn and then put into an urn vault to be buried. – Displaying the urn: If you choose to display the urn at home or somewhere else, then you can make your selection based on which one looks and feels right to you. We have a range of urns that may include just the one you’re looking for. 2. What Size Urn Do You Need? One thing that will help to narrow down your choice is the weight of the deceased, before they passed away. The urn you select will need to have enough room for their remains, so our urns come in multiple sizes (all of which are quite generous). Please speak to us directly if you want to select a special urn that doesn’t come standard in our non-attended cremation service package. 3. What Style and Material Should I Select? The decision regarding the style and material of an urn is a completely personal one and can be made based on what your loved one would have wanted or what you feel fits them best. Our range includes urns made from wood, metal, onyx, sand and biodegradable paper. We are more than happy to guide you in making your decision. Choosing a cremation urn is a largely personal process. All the tips we’ve detailed above will help you in making a decision that feels right for you and represents your loved one. For guidance in selection an urn, call us today on 1300 262 797. What kind of urn are you leaning towards choosing? Let us know in the comments below.